(espn.go.com)- Rory McIlroy suffered a nightmare first round at the Irish Open as he shot his highest total since his final-day Masters meltdown in 2011. The world No. 1 reached the turn at 41 and finished with a nine-over 80, leaving him dead last of the morning’s 78 starters. 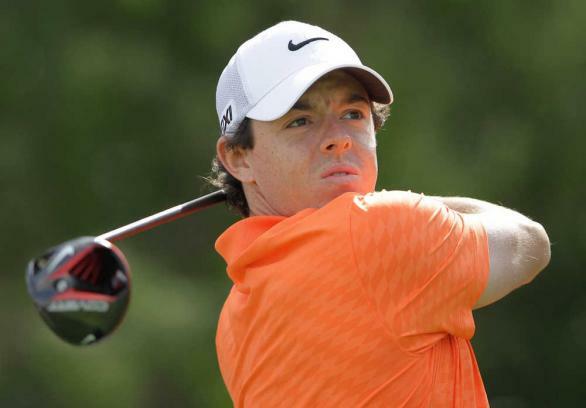 McIlroy is now in danger of missing the cut at his home event for the third successive year. Check WagerWeb and find the best online betting site!!!! Rickie Fowler carded a 71 to move two shots off Danny Willett and Soren Kjeldsen, who share the early lead at two under. McIlroy, though, failed to hit a single birdie along with Martin Kaymer (79) in windy conditions at Royal County Down on Thursday, having missed the cut at Wentworth. Former champion Padraig Harrington impressed in the afternoon’s slightly easier conditions to post a four-under 67, which was later matched by Max Kieffer. Harrington, who enjoyed his first victory on a major tour since the 2008 US PGA at the Honda Classic in March, rallied from one-over after 10 holes to card five birdies in his next six. oren Hansen is a shot further back at three-under, while Englishman Danny Willett sits two-under after his opening round of 69. Elsewhere, former world No.1 Luke Donald carded a 70 to move one-under. The Englishman dropped out of the world’s top 60 on Monday and misses out on qualifying for the US Open. However, a top 10 finish in Northern Ireland may see him earn one of the three available places for the Open at St Andrews. Get all the latest Betting and Sport News updates on your social media outlets. Find us on both Facebook and Google+!